Industry Research Report (Statistics Channel: http://www.chinabuses.org/statistics/) is updating every week and focusing on research & analysis report of China bus industry, such as sales data of China bus builders, latest market information and statistics, which are from professional experts.It employs well-designed method to collect the data and analyze the results. It disseminates the findings to contribute to generalize knowledge. In January 2012, sales of school buses were 1,652 units; 4,577 units of school buses were sold in Jan.-Feb.; In Jan.-March, sale volumes of school buses were 6,489 units; In Jan.-April, 8,490 school buses were sold; In Jan.-May, sales of school buses were 10,022 units; 11,065 school buses were sold in Jan.-June; In Jan.-July, sales of school buses were 13,117 units. In Jan.- August, 17,153 units of school buses were sold. 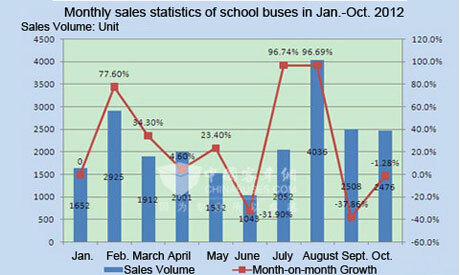 In Jan.-Sept., sales of school buses were 19,661 units; In Jan.-Oct.., 22,143 school buses were sold. Jan. Feb. March April May June July August Sept. Oct.
We can see from the above that sales in Jan.-September increase by 6.15% year-on-year, which is the 9th growth since January. From the lengths, only sales of super large buses and 10-11m buses decrease. Sales of 11-12m buses increase the most and sales of super large buses decrease the most. We can see from the above that: (1) Sales of King Long buses increase by 15.3%, i.e. 2749 units, 9.15% higher than industrial average. (2) Except 5-6m and 10-11m, sales of other lengths increase. Sales of 6-7m increase the most, then 9-10m and 8-9m, much higher than industrial average. (3) Sales of King Long grows the fastest among Yutong, King Long, Higer and Golden Dragon, mainly in 3.5-5m. (4) Sales of King Long super large buses reach 92 units, decreasing 235 units year-on-year. VIP Introduction & Regulation: I wish to subscribe to the Chinabus market data reports VIP section. Tell me how I can register for the subscription service? VIP Introduction & Regulation: I'd like to know more about China school bus data in Jan.- April, How could I know it? VIP Introduction & Regulation: I would like to read your Industry updates. How much is it? VIP Introduction & Regulation: I Would like to join. If you are interested in the industry research report, please fill the following form , we will contact with you in two-work-day according to your effective E-mail address.